Last month, one of our readers pointed out that I share a last name with a famous 19th century phycologist, Théophile Bonnemaison. I am pleasantly surprised to realize that Théophile was the namesake of not only a genus, but also a family and even an order! I don’t know whether I am distantly related to the French naturalist, but it nevertheless brings me a smug pleasure to write about the algae Bonnemaisonia hamifera, of the family Bonnemaisoniaceae, of the order Bonnemaisoniales. I am indebted to Ignacio Bárbara, who kindly sent me the ethereal images of this species that he posted to the Algaebase website. My smugness has dissipated now that I have realized that, unlike my potential ancestor, I know nothing of algae. 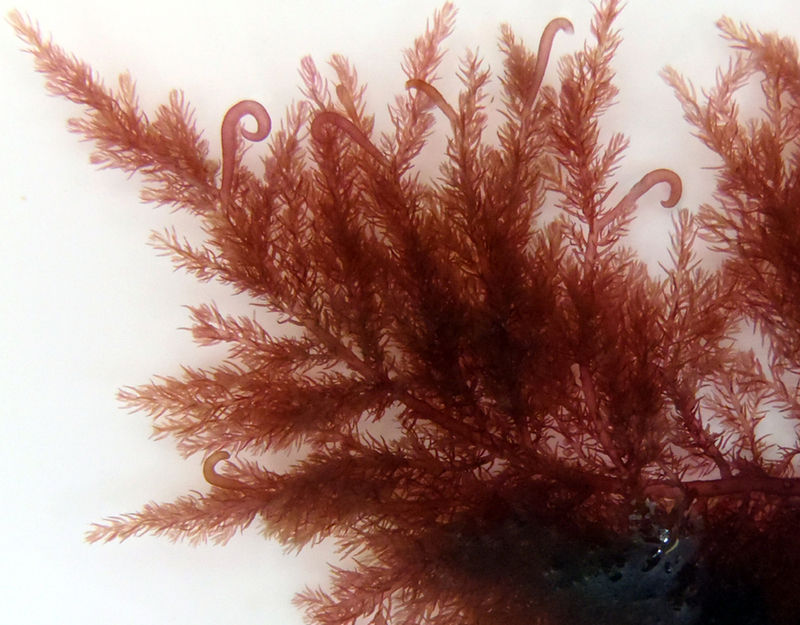 I have had to learn that Bonnemaisonia hamifera, commonly called Bonnemaison’s hook weed, is a member of the Rhodophyta, an ancient division of eukaryotic algae (aka red algae). According to the online Encyclopedia Britannica, red algae “have some of the most complex life cycles known for living organisms”. Please bear with me as I blunder my way through the life cycle and characteristics of this beautiful algae. Like other red algae, Bonnemaison’s hook weed displays alternation of generations; the gametophyte generation occurs in the spring, is bright red, can reach up to 20 cm in length, and forms hooked branches that allow the free-floating plants to attach to other floating algae. Ignacio’s first image of the feathery fronds clearly shows these hooks. When fertilized by a male spermatium (which is carried by ocean currents), the female gametophyte will form a fruiting structure called a cystocarp, (see the green blobby bits on the second photo featured today). Fertilization occurs frequently in Japan, where this species is thought to have originated, but most specimens found in European waters are sterile. The fruiting structures of Bonnemaison’s hook weed produce and release tetrasporophytes which form the diploid generation for this species. These tetrasporophytes are so morphologically unlike their parents that they were placed in their own taxon, Trailliella intricata. The Trailliella intricata phase appears as red cotton tufts measuring 25 mm in diameter (photos in righthand sidebar on that page). These tetrasporophytes can occur year round, but are most common from October to March, and are found on hard substrates and human-produced structures. Bonnemaisonia hamifera has spread to most regions of the world, likely transported on the hulls of ships. 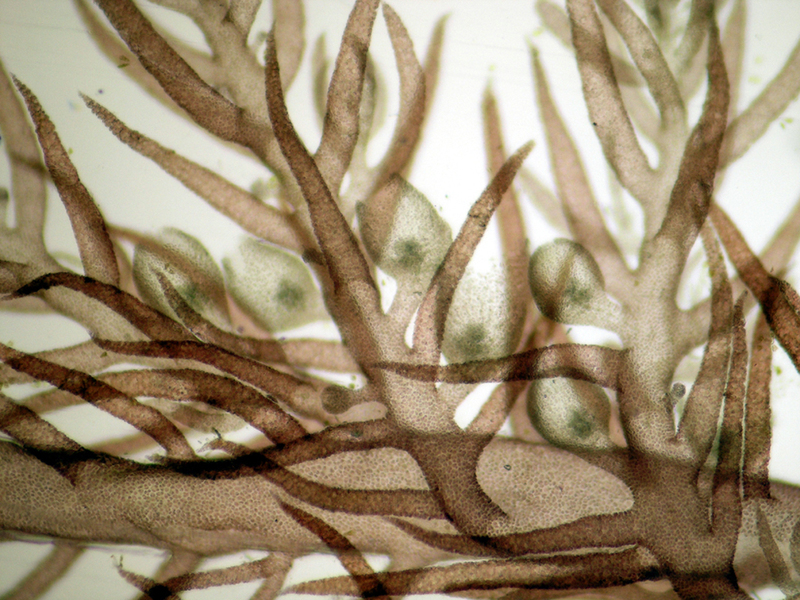 Its gametophyte form competes with native algae in low tidal pools. Ironically, it releases a chemical substance that is being studied as an anti-fouling agent to protect ship hulls. Perhaps this substance will some day be used on ships to prevent Bonnemaisonia hamifera from further spread. Hey, do you know if this is the same family of red algea we get growing on the snow in the Swiss Alps? It sounds similar. Thanks! Such delicate beauty. I live very near Monterey Bay, and have spent many happy hours walking the beach and gazing at kelp fronds. I’m no longer able to do that, but with these photos I can smell the kelpy salt smell, fresh and clean and bracing ! Thanks, Tamara. Best of blest days to all! It says to go the extra click, to be curious I thought today’s entry landed me a chance to hear a discoverer’s tale but I wasn’t quite put off after the great style the author exhibited. Very conversational. Enjoyed every submission read, including non-english speaking South Americans and Asians. What you have to contribute is more important than how you say it. Carry on cleverly! Cherries walks: I didn’t realize some red algae grow on snow. Sounds fascinating! I’ll try to find out more, perhaps for a future entry.